Born into a family of ten children on May 28, 1931, in Sheridan, Wyoming, Ruthie died December 3 here in Chaffee County where she has lived the great portion of her life. The Swanson family, parents Morton and Clara and Clarence, Forest, Warren, Lawrence, Axel, Ethel (Newcomb), Marie (Behrman), Clara Belle (Stranahan), Gloria (Close) and, of course, Ruth were certainly recognizable, important early figures in Buena Vista. Ruth was preceded in death by her husband Edward Russell Lambert and is survived by two remaining sisters, Gloria and Marie and her children Russell (Irene) Lambert, Carol (Floyd) Fauser, Edward (Jolene) Lambert, Joyce Bellingar, Brad (Darcie) Lambert, thirteen grandchildren and, at last count, seventeen great-grandchildren and literally countless nieces, nephews, other relatives and friends. Ruthie enjoyed her life the last four decades in her comfortable humble home on Main street in Buena Vista. There she welcomed visitors not just on special occasions, 4th of July, Thanksgiving, Christmas, birthdays but on just any common day, anyone could stop by for a visit. An excellent cook and baker, many over the years together enjoyed there her very tasty meals ending with slices of chocolate sheet cake or apple pie or red-velvet cake or one of her thumbprint cookies. Ruthie was also an excellent, tireless ‘visitor.’ She could tell vivid stories about her past in Buena Vista and other places where the Lamberts lived, Alaska, Washington state and of episodes involving her parents and siblings. She enjoyed sewing, quilting, upholstery work and, for a number of years, worked in the Buena Vista Drug Store. Her main work, her passion, if you will, however, was being a wife, mother, homemaker and a loving companion to her many other family members. At age nineteen, she adopted her three (eldest who at that time just 5, 4 and 3 years of age) children. 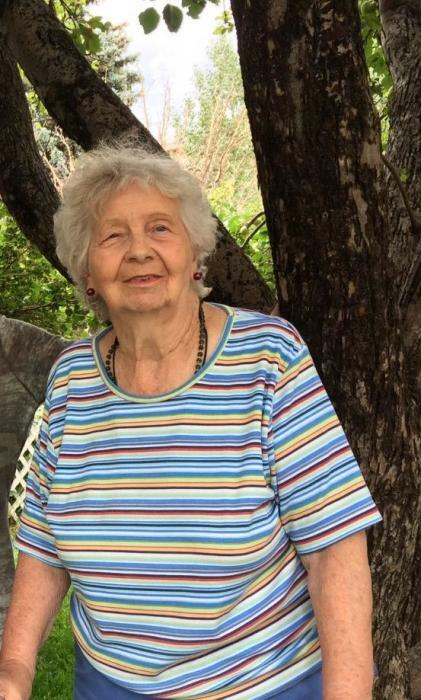 In her last days of her 87th year, she enjoyed loving and being loved by older sister Marie at the Columbine Nursing home and the many others who visited her there. Ruthie was a kind, happy, motherly, caring, interesting lady. She lived a long life, filled with early poverty and later, with her family, travel, adventure, at times adversities and always blessed with love both for the many whom she loved and those who love her. She will, of course, be greatly missed. A celebration of life will be held 11:00 AM Saturday January 12, 2019 at Congregational United Church of Christ in Buena Vista.